Evergreen custom sunglasses feature beautiful pine tree needles on frost temples and a frost front frame with premium smoke lenses. This custom sunglasses design is part of Canvas Eyewear's Nature Collection, and is available exclusively here on CanvasEyewear.com! Grass custom sunglasses feature bright green blades of grass on frost temples and a frost front frame with premium smoke lenses. Bon Temps graffiti custom sunglasses feature a colorful graffiti street art mural of wickedly smiling faces on frost temples and frost front frame with premium smoke lenses. Face Blocks graffiti custom sunglasses feature a colorful graffiti street art mural of block faces on frost temples and a frost front frame with premium smoke lenses. Graphite graffiti custom sunglasses feature a brightly colored neon graffiti street art mural mixing blue hair, flower freckles, and abstract design on frost temples and a frost front frame with premium smoke lenses. Octohat graffiti custom sunglasses feature a colorful graffiti street art mural of blue grimmacing face wearing an octopus hat on frost temples and frost front frame with premium smoke lenses. Peace Rabbit graffiti custom sunglasses feature a colorful graffiti street art mural including a rad rabbit throwing up a peace sign on frost temples and a frost front frame with premium smoke lenses. Burger & Fries custom sunglasses feature a medium rare cheeseburger - with all of the fixin's - on a frost front frame, perfectly cooked french fries on frost temples, and premium smoke lenses. Hot Diggity Dogger custom sunglasses feature hot dogs upon hot dogs upon hot dogs with all the fixin's on frost temple and a frost front frame with sunset mirror lenses. Mmmmm...Bacon custom sunglasses feature bacon, bacon, and more bacon on frost temples and a frost front frame with premium smoke lenses. 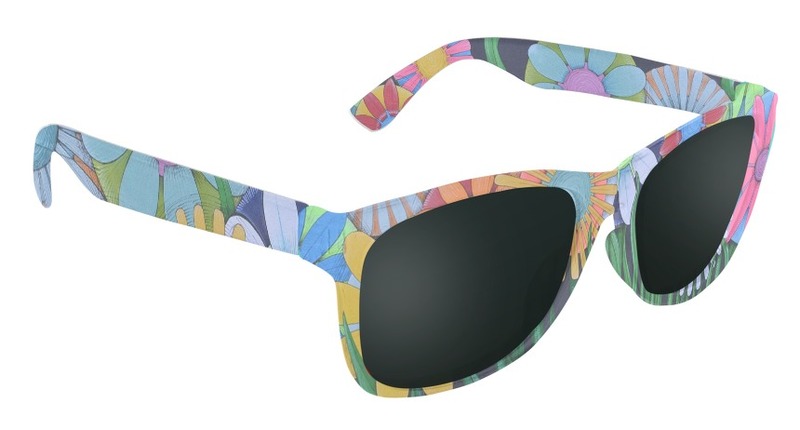 The future of custom sunglasses is here, and you're the designer. Upload your own images and designs to customize your sunglasses and create a pair of wayfarers you can truly call your own!